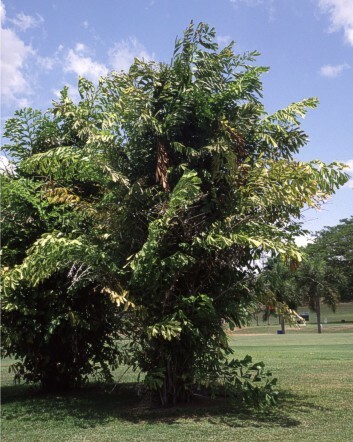 This poor Fishtail Palm grows on a place it obviously doesn't like at all. It visibly suffers. Fishtail palms received their name for the shape of the leaves, but it also indicates they really like it moist to wet. Without reliable water supply and air moisture they won't thrive. This one also has to fight a weed. Want to see how they look like in South Asia, where they come from? Click here.